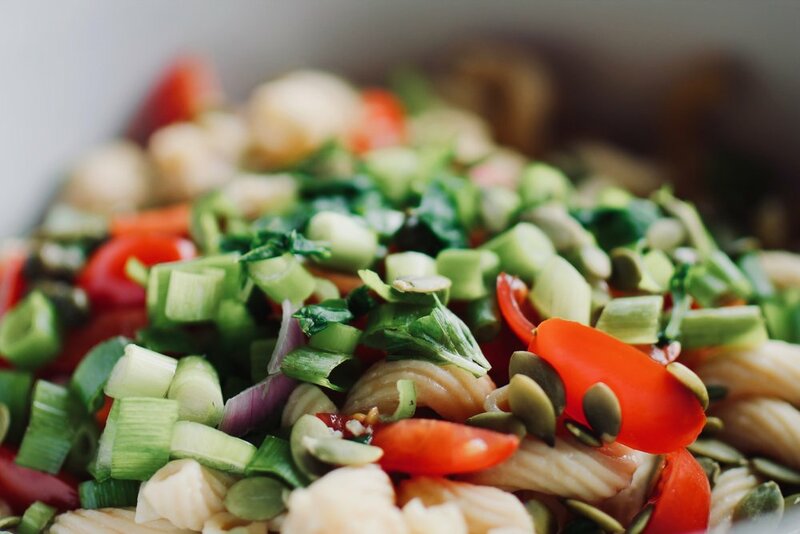 To compensate, I made a refreshing yet hearty pasta salad — one that tastes especially delicious before a large bowl of ice cream. Because balance, right? 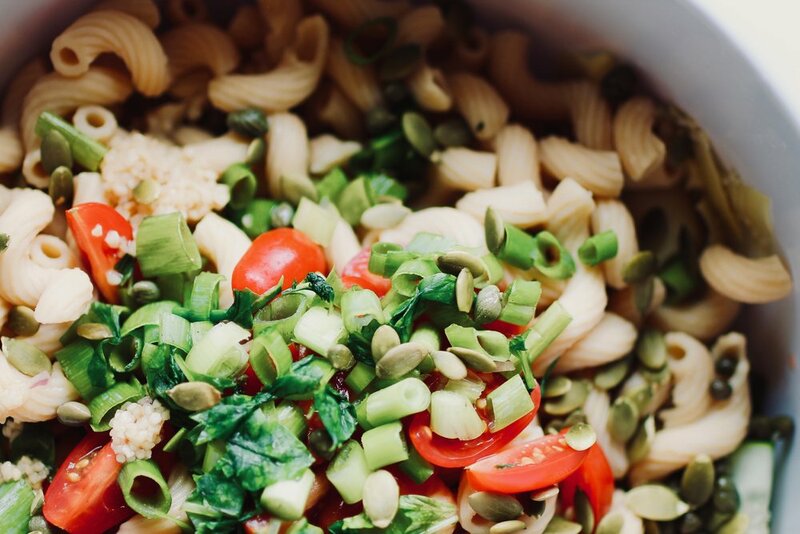 Much like this recipe, you'll find colorful, vitamin-rich veggies, protein-packed pasta, and fresh herbs in the ingredient list below. Start to finish, this recipe took me 15 minutes. That's it. And the beauty of this pasta salad is that it tastes better as time passes. Keep it in the fridge and enjoy liberal bowls all week. Meal prep, done. This particular dish happens to be gluten-free and vegan, but feel free to use any pasta you have on hand. It's also the perfect accompaniment to a backyard potluck, weekend BBQ, or weekday lunch. Enjoy! 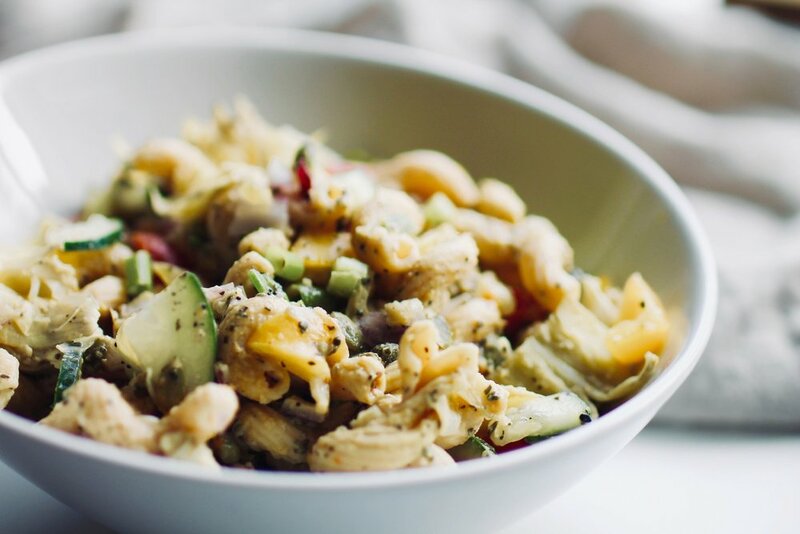 With a variety of flavors and textures, this pasta salad will keep you coming back for more (a good thing, no less). I've included a few sources of healthy fats, protein, and complex carbs to keep you nourished and satisfied. 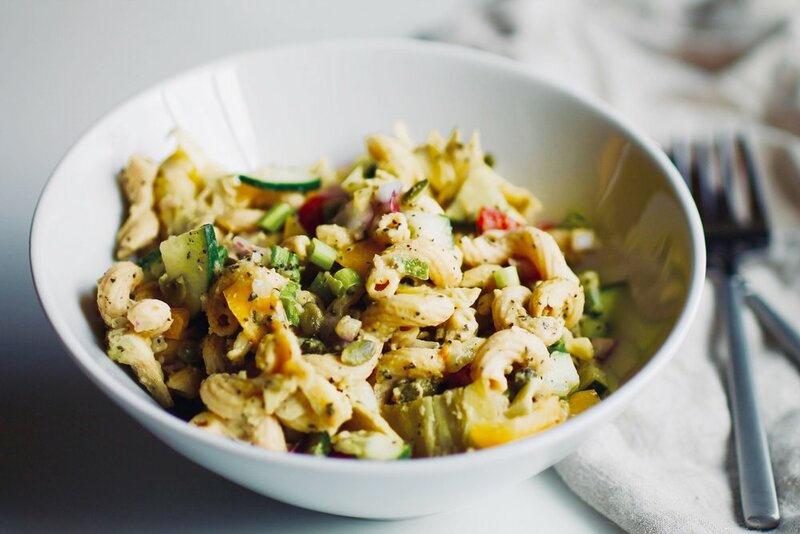 While I omitted mayo — a standard ingredient in traditional pasta salad — I included this hummus for a creamy, well-coated consistency. 1. Cook your pasta according to the package. 2. While the pasta is cooking, rinse + drain your artichokes and chop into bite-sized pieces. 3. Chop the rest of the large veggies and herbs (green onion, bell pepper, red onion, cucumber, cherry tomatoes, and basil). 4. In a large mixing bowl, add all veggies, herbs, and seeds (including your capers, garlic, and pumpkin seeds). 5. Once the pasta finishes cooking, rinse with cold water and add to the large mixing bowl. 6. Toss the pasta, veggies, herbs, and seeds together until the ingredients are evenly dispersed. 7. To the bowl, add your container of hummus and drizzle on your avocado oil. Evenly mix the hummus and oil until all ingredients are coated. Add a pinch or two of sea salt and a few cracks of black pepper. For an extra kick, feel free to add red chili flakes! 8. If eating immediately, stick the mixing bowl in your freezer for 3-5 minutes. Then, serve. If eating later, store in the fridge, covered. P.s. Stay tuned for a recap (or two) of our trip to Hawaii. I hope you had a wonderful Fourth of July.